As part of its wide portfolio of business intelligence services to members, IABM conducts an end-user survey twice a year – immediately prior to the NAB Show and IBC. The surveys include questions across the full range of end-user concerns – Business Sentiment & Outlook; Revenue: Current & Future Sources; Broadcast & Media Technology Procurement; Drivers of Product Choice; Impact of IT Technology; Broadcast & Media Technology Adoption; and Collaboration. 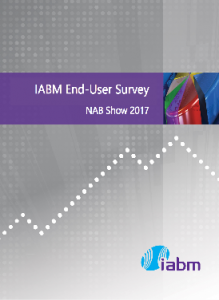 IABM has just published the results of the NAB Show 2017 End-User survey, and while responses are inevitably skewed towards American concerns (72% of respondents were US-based) they nonetheless provide invaluable insights into the state of the end-user business today, and where it is heading tomorrow. Comparisons with the IBC 2016 survey also point out both similarities and differences between primarily European and US markets, and as the body of surveys continues to grow (IABM conducted its first end-user survey in 2012), trends begin to become evident. Confidence in North America remains high despite the major changes affecting the market. This can be brought back to a positive 2016 for most end-user organizations. In fact, in 2016, various sporting and political events helped traditional broadcasters boost advertising revenues. With regards to Pay-TV, 2016 was quite negative with most operators losing a significant number of subscribers. Despite the trend in subscriber figures, IABM’s End-User Index data shows that both media networks and Pay-TV operators are growing revenues at the moment. The End-User Index tracks the financial performance of broadcast and media technology end-users. The broadcast and media industry is evolving rapidly as video and audio content becomes available on multiple platforms. The challenge for broadcasters and content owners has been to find a way to satisfy this consumer demand while at the same time generating incremental (and profitable) revenue. Comparing the operating profit margins of traditional media companies such as Disney and CBS with those of next-generation video providers such as Netflix and Amazon Instant Video shows a striking difference. While most traditional broadcast customers boast operating margins between 20% and 40%, next-generation media customers’ margins are generally between 0% and 10% – Netflix’s operating margin in 2016 was 4%. 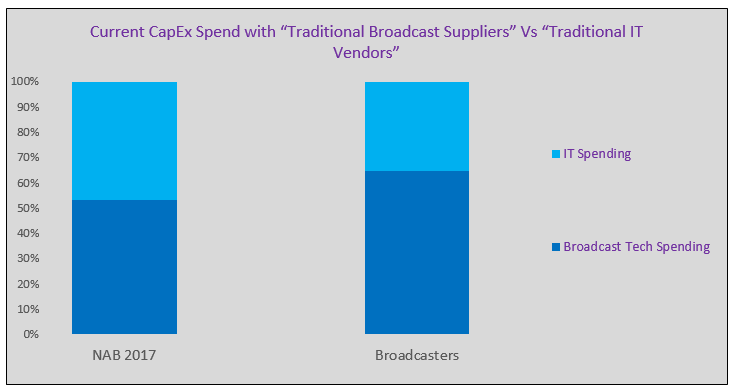 Operating profit data from our IABM End-User Index are shown on the chart below – we have identified a “Broadcast Realm” and an “OTT Realm”. On a global basis, new activities such as multi-platform content delivery are already key revenue drivers for many types of end-users. This is not surprising: a plethora of consumer research studies have demonstrated how viewing habits have shifted to new platforms. Expectations have greatly risen as consumers now demand to watch video on a variety of connected devices when they want and, most importantly, where they want. This has not been good news for end-users who are seeing their traditional business model – funded by “broadcast dollars” – progressively eroding in favor of new ways of delivering video – which hold the promise of “digital pennies”. Respondents were also asked how they believe their revenue will evolve – what percentage of their revenue in 2-3 years will be derived from traditional Broadcast operations compared with new activities such as web, mobile, streaming, multi-platform content delivery etc. Unsurprisingly perhaps, the results show that most respondents anticipate a shift in their revenue away from traditional broadcast operations in favor of monetizing content over alternative delivery platforms. This has been a rising trend ever since our first survey in 2012; the percentage of respondents in this edition of the survey who said that they would generate more than 60% of their revenue from traditional operations in 2-3 years’ time was 35%, down by nine percentage points compared to the question on current revenue sources. Topping the list of the projects considered most important “multi-platform content delivery”, which was cited more times than any other project as the most important strategic priority for broadcast and media technology buyers. Media technology end-users continue to prioritize multi-platform delivery initiatives as audiences’ viewing preferences shift to new mediums. This has been a primary priority for end-users for quite some time now. 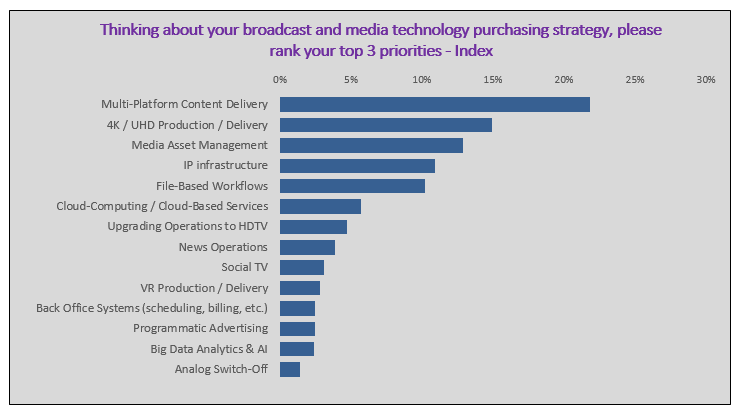 “4K/UHD production/delivery” and “media asset management” were cited as the #2 and #3 most important priorities respectively. The industry’s broadcast and media purchasing decisions are becoming increasingly business-oriented rather than technology-oriented. 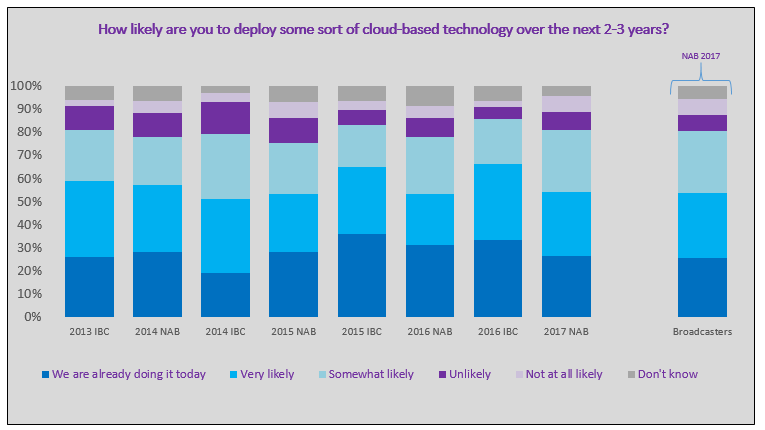 Responses to the question ‘how likely are you to deploy some sort of cloud based technology over the next 2-3 years?’ are shown in the following chart. This article is inevitably gives just a small window into the rich information produced by the End-User Survey – the full report runs to 75 pages. You can read more about it on the IABM website. https://www.theiabm.org/business-intelligence/end-user-survey.